Posted May 28, 2007 in 2007/05, z Archive. 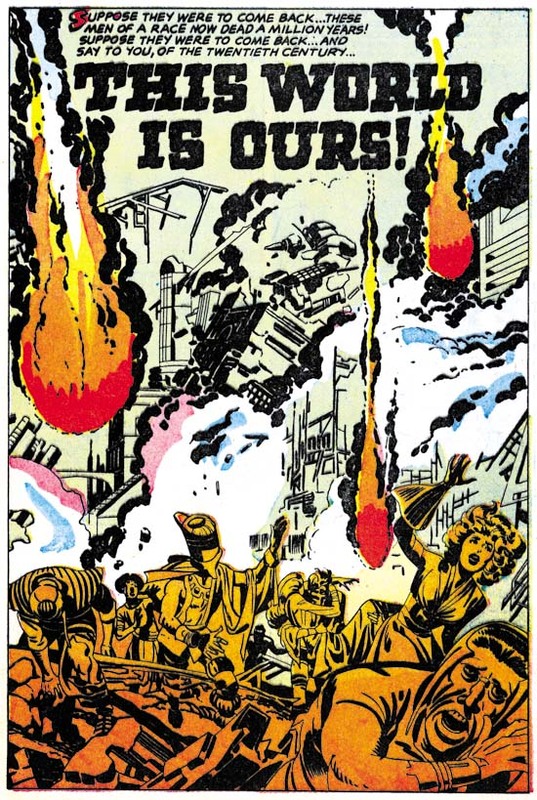 In Chapter 8, More Harvey of Jack Kirby’s Austere Inking I briefly examined “This World Is Ours” from Alarming Tales #3. Some have suggested Steve Ditko as the inker but when I wrote that chapter I had not seen any Ditko inking from that period. 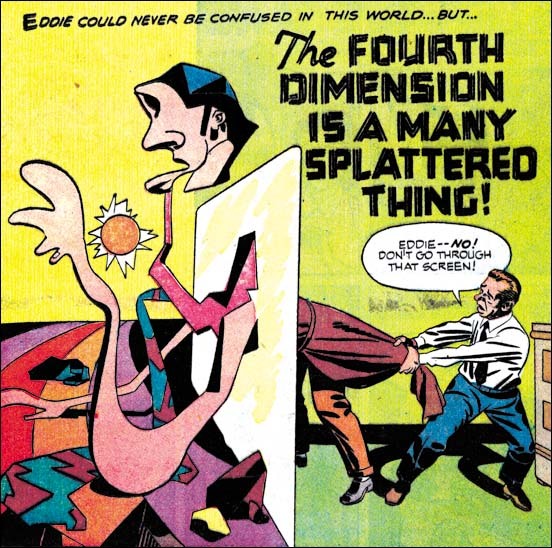 Well Dave Sim reviews some Ditko comics from this period and links to images are included. 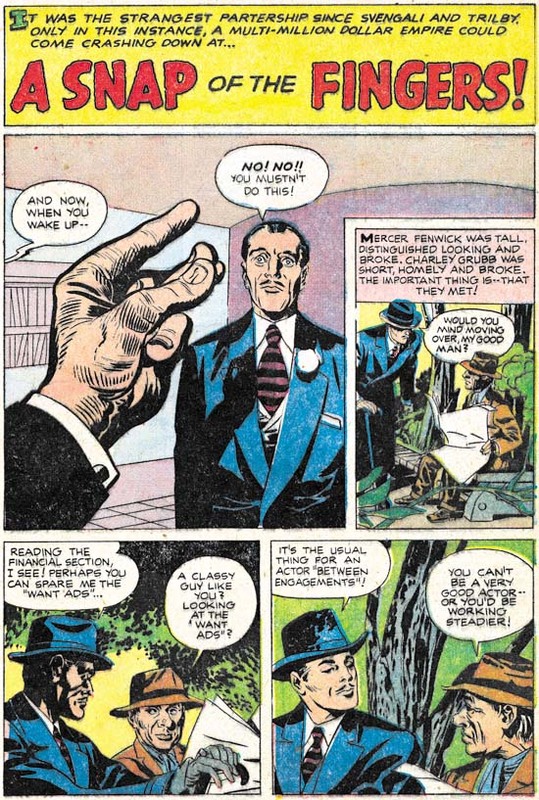 If this material is any indication it looks like Ditko was inking mainly with a pen and it does not look like what is done in “This World Is Ours”. 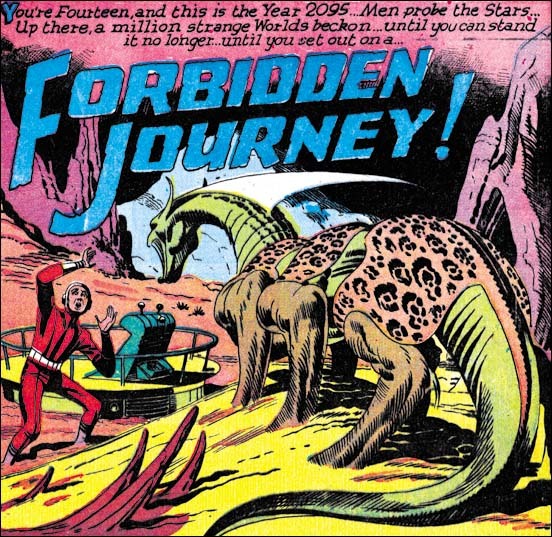 So as far as I am concerned this story was inked solely by Jack Kirby. Posted May 26, 2007 in 2007/05, 7 Freelance, Harvey, Periods, z Archive. In Chapter 5 I limited discussion about Harvey work by Kirby to those with cover dates in 1956. 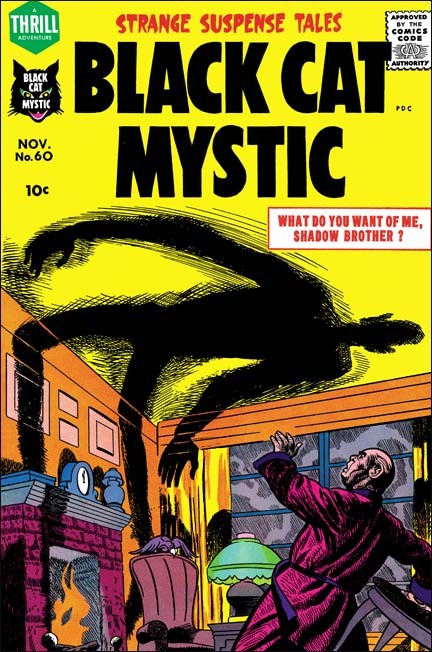 Among those works was art for Black Cat Mystic #58 (September 1956). That title had some stories that were inked by Jack. Some were done in standard Studio style while others in the newer Austere style. The combination suggested that the work may have begun slightly earlier then the cover date suggested but basically agreeing with other work Jack inked in 1956. In the next two chapters I discussed freelance work that Jack did for Atlas and DC. Work begun for Atlas in December 1956 and for DC in February 1957. The standard Studio style does not appear at all for that body of work. There is some Fine Studio Style used for some of the early Atlas work but otherwise everything is done in the Austere style. The main variation is how much use, if any, of spotting with a pen. 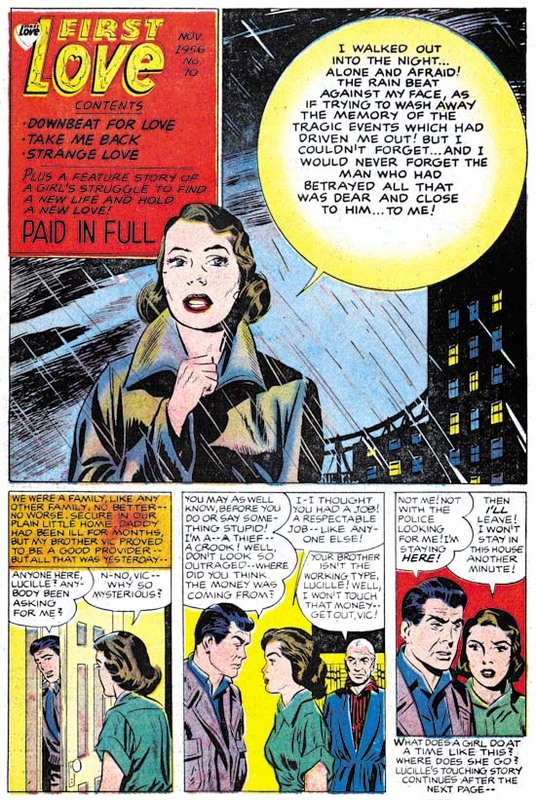 I have not yet discussed Kirby’s inking for the Prize romance comics of this same period but it also was done with Austere inking. 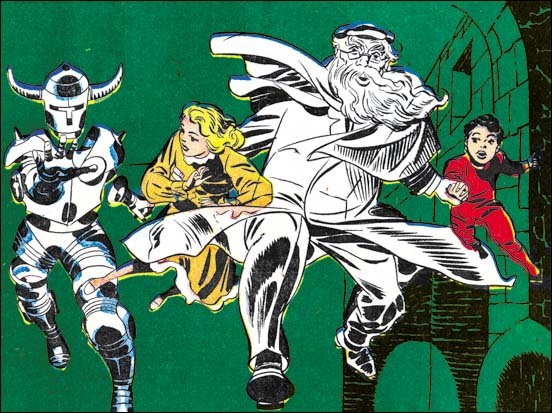 Considering the type of inking Jack used in 1957 for Atlas, DC and Prize we would expect to find in Black Cat Mystic #59 (with cover date September 1957) the same Austere inking. Instead we find typical Studio inking very much like what we saw in BCM #58 from a year ago. 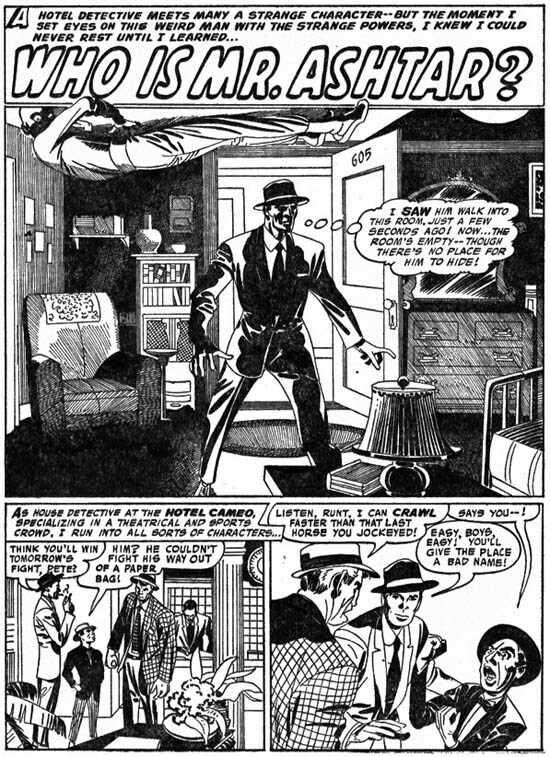 In the splash panel for “Take Off Mr. Zimmer” shown above we can see some use of a standard picket fence. Also look how strong the form lines on Mr. Zimmer’s left billowing overcoat. Such bold lines would have been quite at home just a couple of years previously but are not found in any of the DC or Atlas work. There are some shadows in the background on our lower right whose brushwork does not reflect any stonework. Under Austere inking these would almost certainly been flooded with black ink. 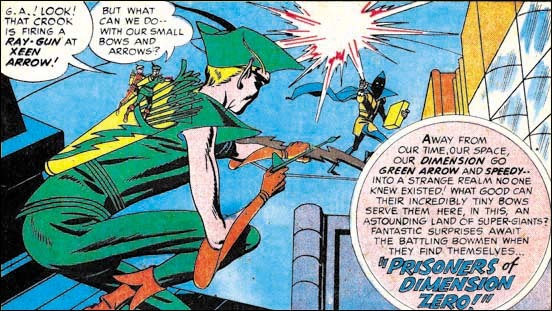 So why did Kirby revert to his older inking style? The answer, in my opinion, is that actually he did not. I am sure this art was made some time in 1956 probably roughly the same time as that for BCM #58. The inking for BCM #59 matches well with what Jack did in BCM #58. The year between these two issues probably had not been part of the plan, at least as far as Simon and Kirby were concerned. Not long after they finished the art for BCM #58 they started working on BCM #59. But for whatever reason Harvey decided to delay publication for BCM #59 for a year. I just wanted to provide another example from Black Cat Mystic #59. 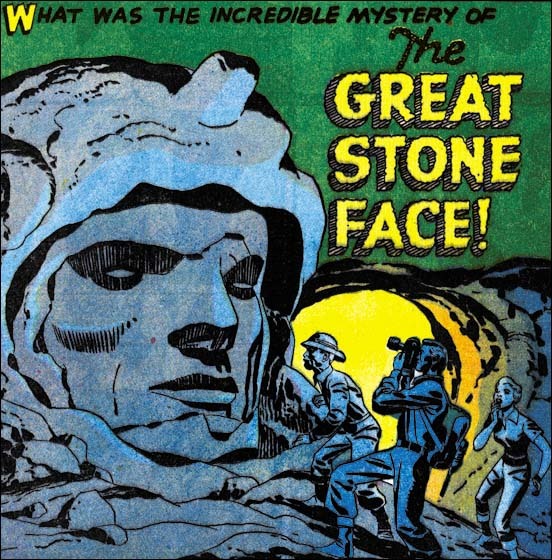 We can see from the splash to “The Great Stone Face” that once again it looks like typical S&K Studio inking. The shadows on the stone face are created by bold brush lines close enough to each other to leave only a small strip of “white” in between. This type of dark shadows would not be expected in the Austere where it would most likely been done by flooding the area with ink. The face’s left cheek is not inked quite so densely but still consists of robust brush strokes. Austere inking might have similar lines but I suspect they would be more finely done. Surprisingly after a year’s publication delay when BCM #59 was finally released it is joined by a new title, Alarming Tales. Alarming Tales maybe a new comic but it has the same type of stories as BCM, excluding Mr. Zimmer. In fact the cover story, “Donnegan’s Daffy Chair”, was originally slated for BCM #59. At first Harvey did not seem all that interested in the horror genre, why else would he wait a year to publish BCM #59? Then suddenly Harvey wants to publish two horror titles at the same time and on the same bimonthly schedule. It just does not make sense. Although I cannot explain Harvey’s motivation, it did result in a really great comic. 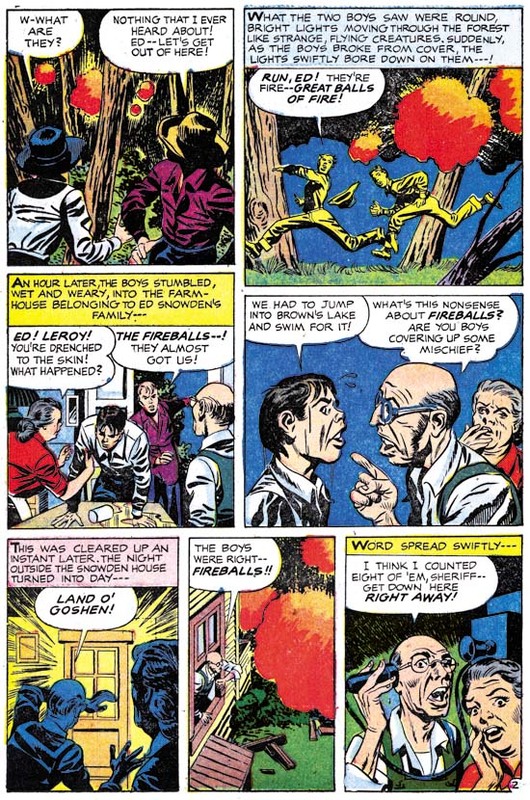 As far as I am concerned Alarming Tales #1 is among the best of the comics that Kirby help create during this period, surpassed only by Yellow Claw #2 and #3. Other then the cover the entire comic was drawn by Jack. Kirby also did all his own inking except for one two page story. The stories themselves are quirky and just pure Kirby. But back to Jack’s inking. 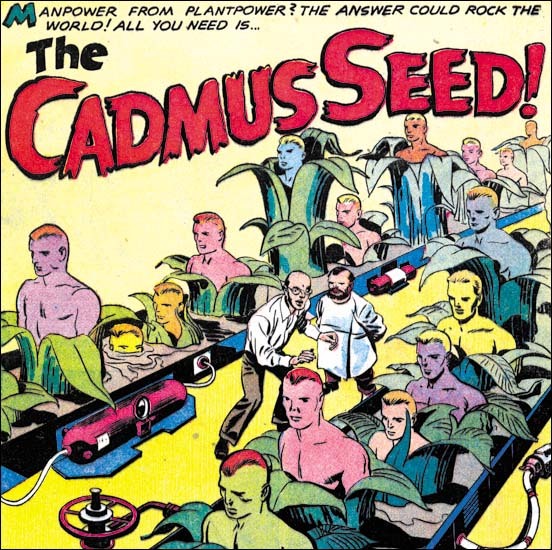 A look at the splash for “The Cadmus Seed” might convince us that Kirby was doing Austere inking. No sign of the use of picket fence and an overall lightness. Where there are black areas they are flooded with ink without brushwork. 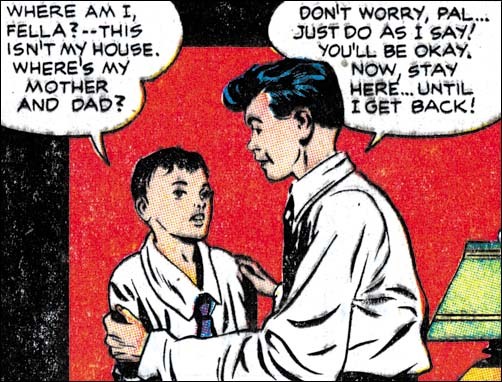 However with panel 3, on the same page as the splash, we find typical picket fence inking. The pickets are done with a brush, not with a pen. So like BCM #59 we seem to have a story inked in a manner resembling what Jack was doing in 1956. That is a combination of work with Studio and Austere inking. I want to provide another example of inking that looks like it is transitioning from S&K Studio to Austere style. For “The Last Enemy” splash we once again find some nice, typical picket fence brushing. We also find some areas flooded with ink very much like Austere. The cloth folds also are simpler shapes and used a little more sparing as in Austere. The image overall has the lightness found in typical Austere inking. 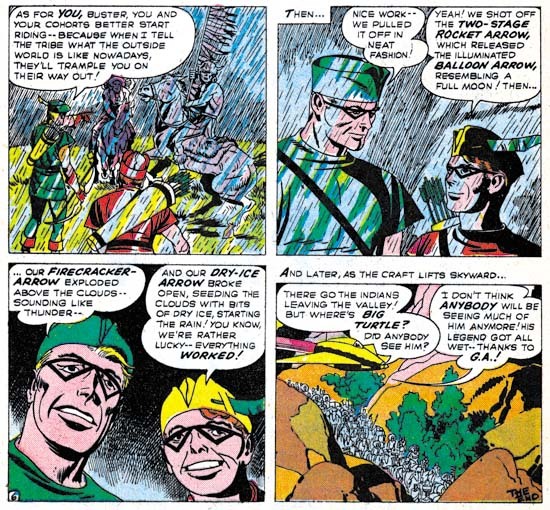 So as we saw in “The Cadmus Seed” this story seems to fit better with the inking Jack did in 1956 then it does with what he was doing in 1957 for Prize, Atlas or DC. How cool can you get. 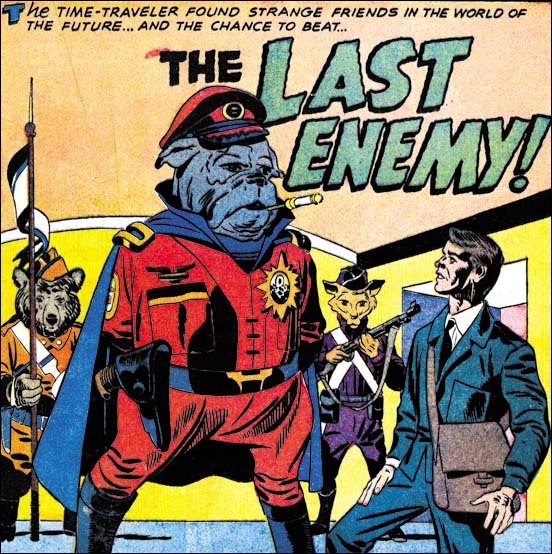 “The Last Enemy” is so obviously a prototype for Kamandi. Of course Kirby made changes when he revisited this theme so many years later. 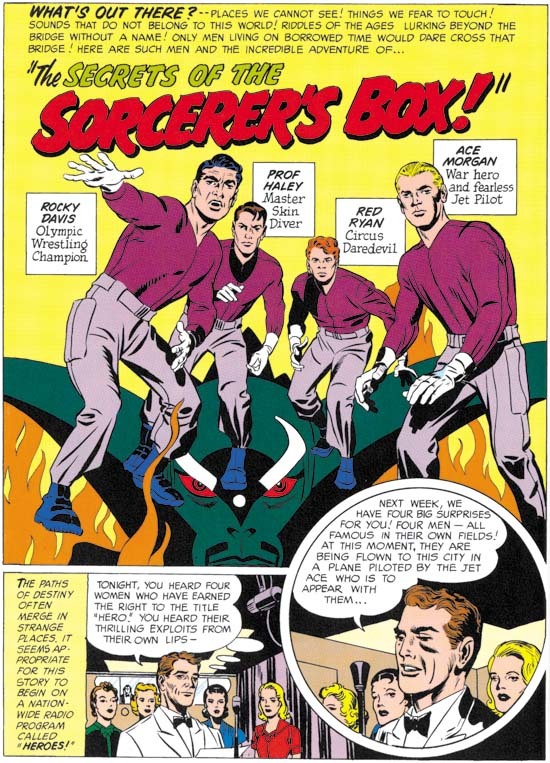 Jack would recycle other Simon and Kirby creations as well. 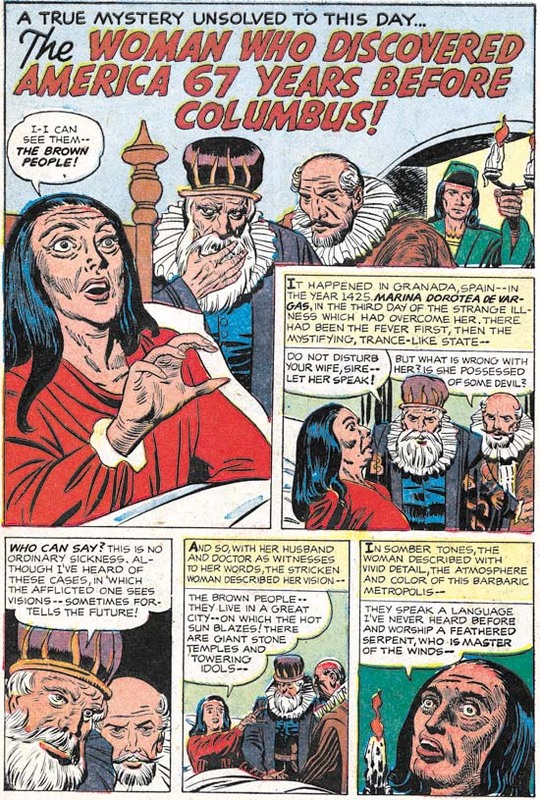 For instance Bill Draut’s the Red Demon was the seed for Kirby’s Demon. You cannot call this copying because as part of the S&K team Jack was involved in the original creation. It is an interesting aspect of Kirby’s working method nonetheless. This story from the same AT #1 issue looks like full blown Austere inking. No picket fences or other S&K Studio techniques. Simple cloth folds and an overall light image. 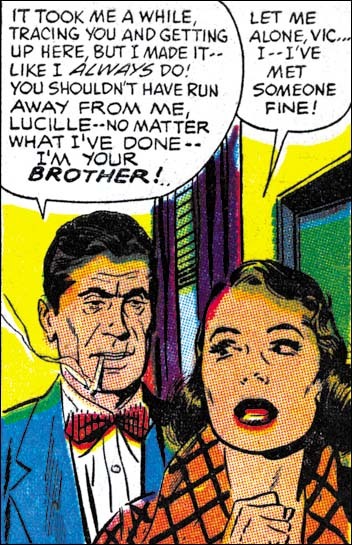 It maybe wise not to make too much of this because the story is such an oddity in Kirby’s oeuvre. Most of it takes place in another dimension where everything consists of simple but ever changing shapes, even the hero. Still what is there looks like typical Austere inking. With the next issue of BCM Jack is recognizably working in the Austere manner. Above I provide an image of a typical panel. Simple cloth folds, some of the just oblong ovals, a shape I describe as spatulate. Simplified negative folds on some of the lower legs, but still having the Kirby feel to them. Light overall image with blacks done by flooding ink. Even an abstract arch shadow makes an appearance. 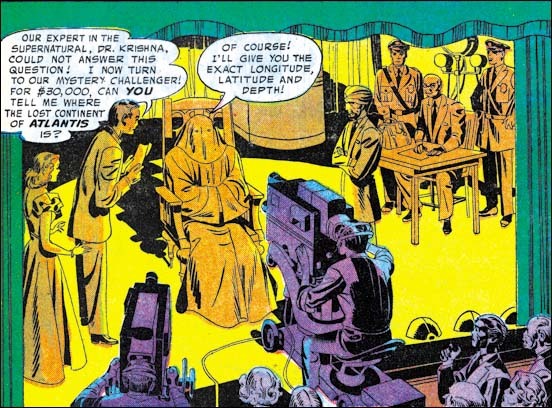 Although there was similar Kirby inking in 1956, it would also fit quite nicely with what he was doing in 1957 as well. Not all the inking was done by Kirby. 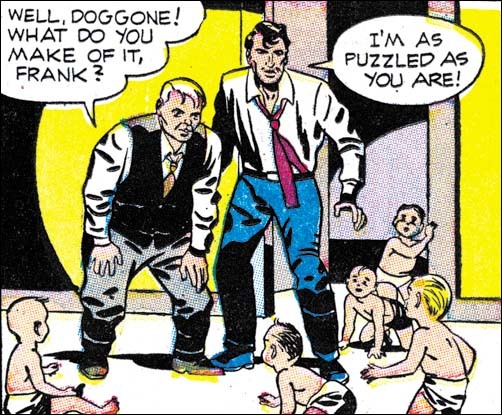 Look at the panel from another page of the same “A Town Full of Babies” story. 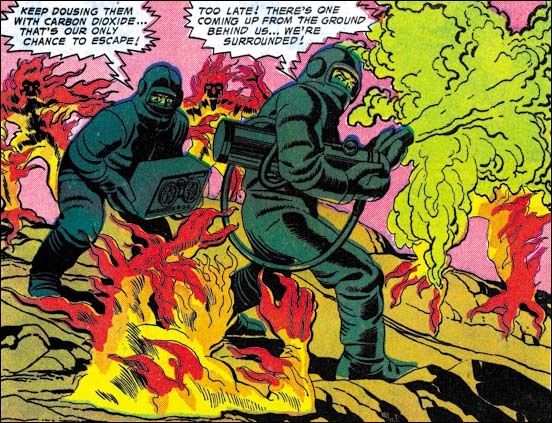 Some of it looks like Kirby’s Austere inking. Overall lightness and flooding blacks. However also examine the cloth folds. They are all long, narrow and rather pointy. Even the line inking makes the faces not quite look like the ones Kirby did. I cannot say who the inker is but he is not Jack. Alarming Tales #2 came out in the same month as BCM #60. In it we find some things we did not see in BLM #60. 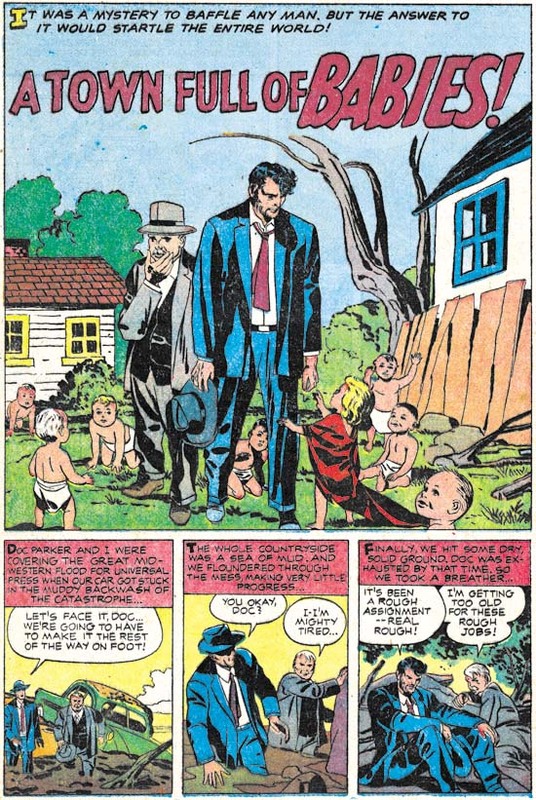 Case in point is panel 4 from page 2. There we find picket fence spotting. But not just any picket fence, this was done with pen. The same sort of technique Jack used for some Atlas work he did at the end of 1956 and the beginning of 1957. Not long ago it was recently pointed out to me that a page from “This World Is Ours” was up for sale on eBay. In the listing the seller suggested that it was inked by Steve Ditko. In all fairness the seller later added that he had received some email indicating that some disagreed with that attribution. 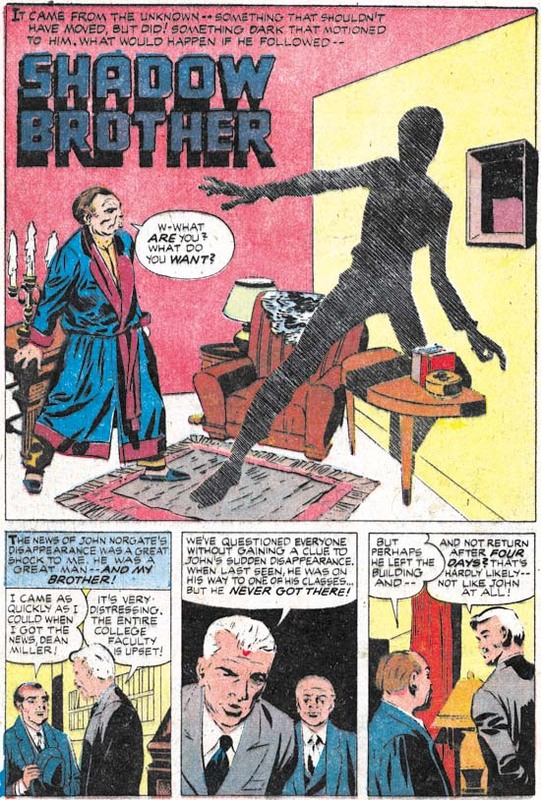 I wonder if some people have suggested Ditko inking based on the man in the lower right corner of the splash page. 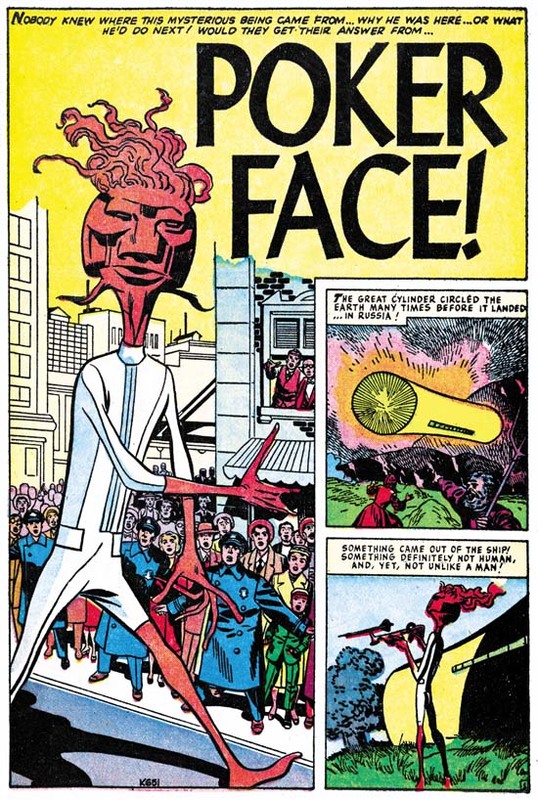 I think he has a Ditko look to him. 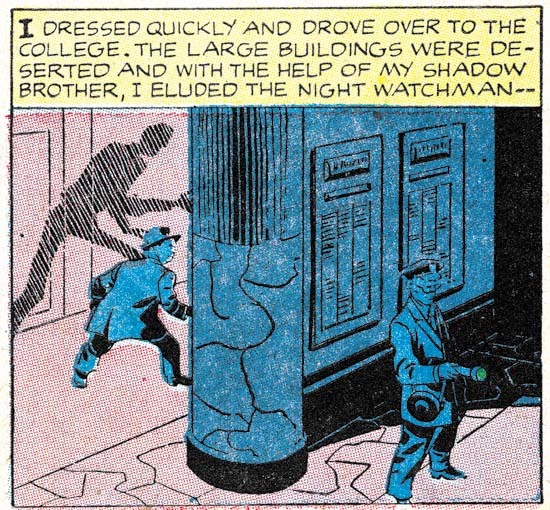 Unfortunately I really have no idea what type of inking Ditko was doing at this time. I certainly would not want to base my attribution on that one face. Perhaps because the splash image is so filled with the fireballs, I find nothing else on it that provides me with any good clues for the attribution. Besides which I always like to look at the inking for the entire story. 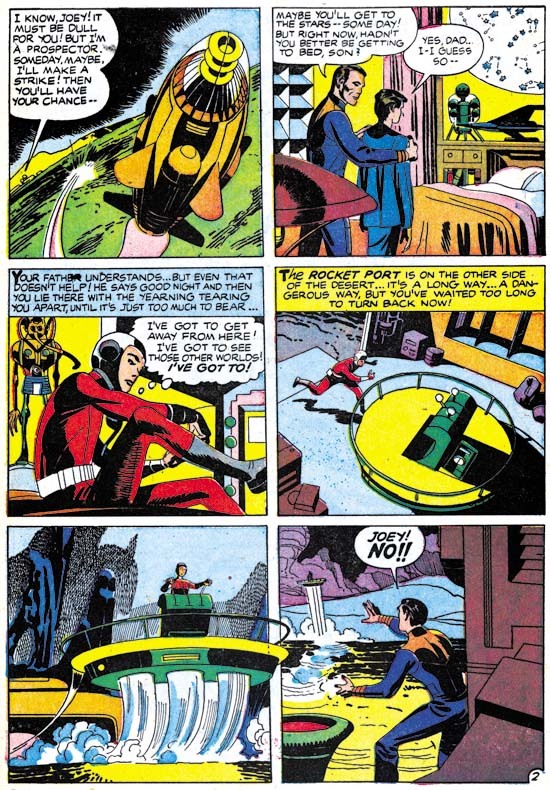 The second page has a very familiar look, it is Jack Kirby doing his Austere inking. We find simple, often spatulate, cloth folds, negative cloth folds, flooded blacks and even a shoulder blot. I have not yet reviewed Jacks late work for the Prize romances, but we will see the rather abstracted upper eyelids of panel 5 again there. The presence of pen spotting should not come as a surprise because we have seen it often before in the Austere inking for Atlas and DC. With this in mind and returning to the splash I find nothing in the brush work that I have not seen Kirby do previously. I will not discount the possibility of other inking hands at work on this story, but clearly Jack’s played an important part in the inking. For each issue of Alarming Tales there are less and less art penciled by Jack. Moreover there seems to be increase in the inking of Kirby’s work by other artists. 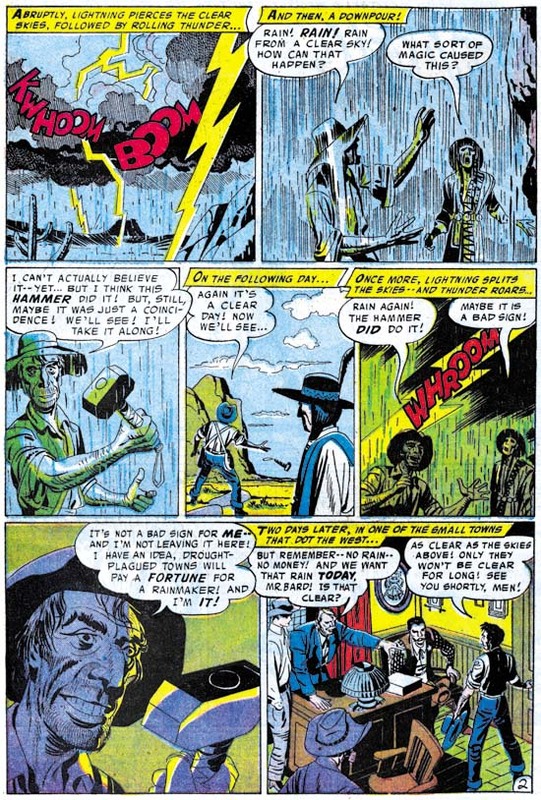 For Alarming Tales #4 Jack only drew “Forbidden Journey”, but what about the inking? Let us start with the splash panel. One thing that stands out is there are some picket fence spotting on the rock formation on the right. It is done with a brush and looks pretty good although the pickets are bowed ever so slightly something I have not seen Kirby do. Let us next examine the form lines on the monster’s legs. You can find Kirby doing something like this on occasion. But again something looks a little off to me. The lines are pretty uniform in thickness along their length. Jack’s form lines tend to widen and then perhaps thin out again. But Jack is not an automaton and these small differences could just be explained as normal artistic variations. So perhaps it is best to reserve judgment until we look at some other pages. On page 2 we find what looks like Austere inking with some pen spotting. In the second panel we even find a shoulder blot. Normally I would consider that good evidence of Jack’s inking. What bothers me most is the spotting of panel 3 of the same page. Unfortunately the full page image does not make it clear so I provide a closer view. There looks like there is picket fence on the youngster’s leg. But look more carefully and you will find some other sort of pattern entirely. 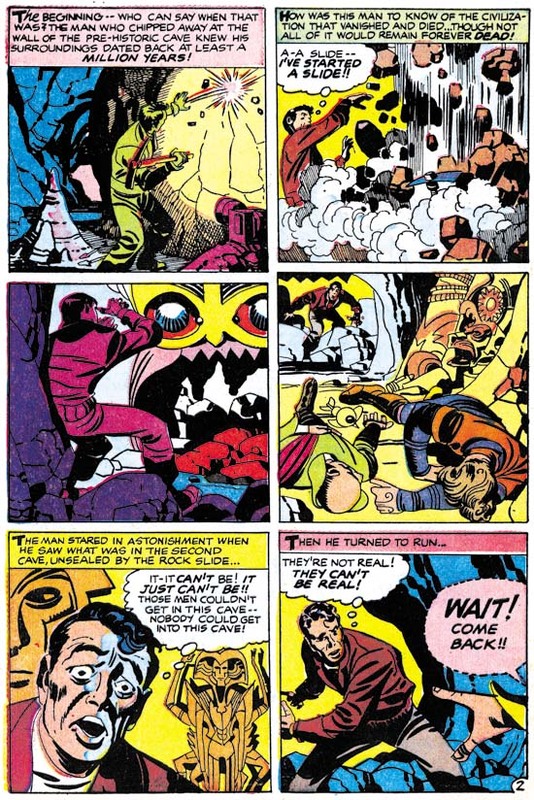 I have never seen Kirby do anything like this and I do think he did it here. I am convinced what we have is another inker whose is a good artist but initially was not quite sure how to ink Jack’s work. So he has examined S&K art with Studio inking and picked up some ideas. Of course there is no attempt to really mimic Jack’s inking because no art credits are given anyway. So although some of the brush techniques are modeled from Jack, the inker works with in his own particular fashion. Also some of the inker’s own techniques show up as well as in the odd (for Jack) spotting on the boy’s leg. Still whoever the inker is he did a real nice job. Black Cat Mystic and Alarming Tales went on for some more issues but without any work from Kirby. That was not the end of Jack working for Harvey comics. He would return in September and November for Race To The Moon #2 and #3. None of that was inked by Jack, instead Al Williamson would do the honors (as well as penciling some of his own stories). 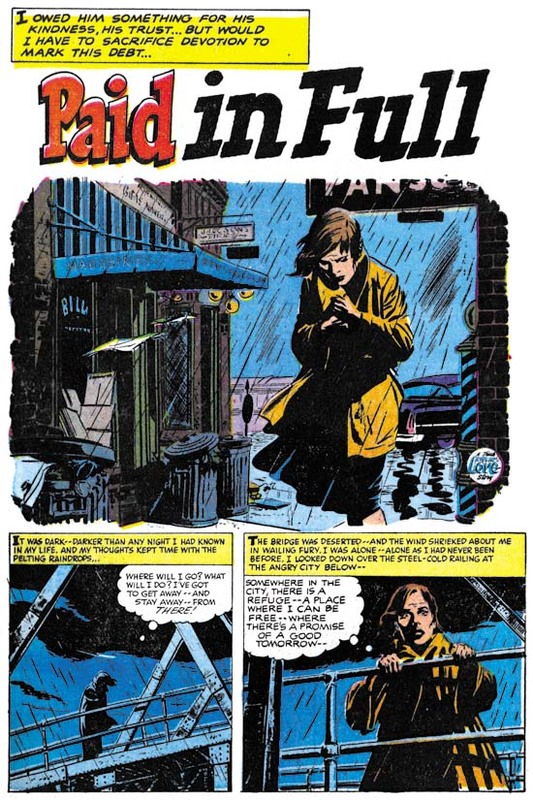 Al Williamson is a great artist in his own right with a style somewhat different from Kirby’s. But you can tell Al had a lot of respect for Jack’s work and the inking job he did is just suburb. Continue With Kirby Imitating Other Artists? Posted May 19, 2007 in 2007/05, Uncategorized, z Archive. 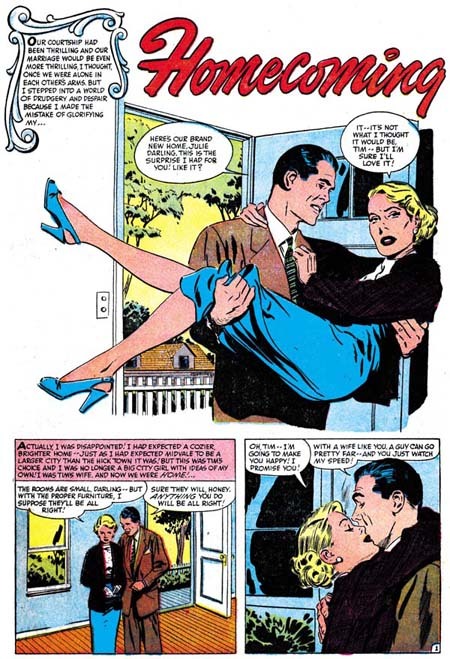 The preview stories from the content pages of some Harvey romances had puzzled me for some time. Not that I gave them a lot of thought but they just looked funny to me. 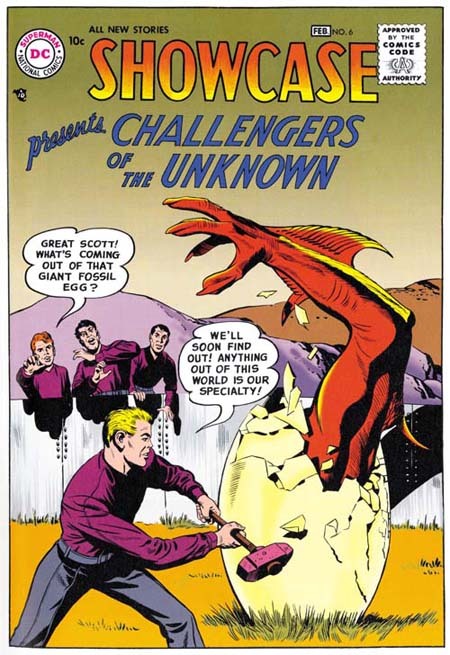 When eventually I did take a good look at First Love #69 and realized that it was Kirby imitating Draut things finally started to make sense. I have already posted on three of them but there are more. I did a quick look at some others and I believe there maybe six more Kirby “ghosting” other artists. It does get a bit complicated because there are some other content previews that look like it is Joe Simon doing the imitations. Also some that from a brief viewing are a little hard to be sure. But just because I find these interesting does not mean that anyone else does. I fully admit that these are not great works of art. So what I would like to know is whether any of my readers think I should continue with these Kirby “ghosting”… posts? Posted May 15, 2007 in 2007/05, Odds & Ends, Topic, z Archive. 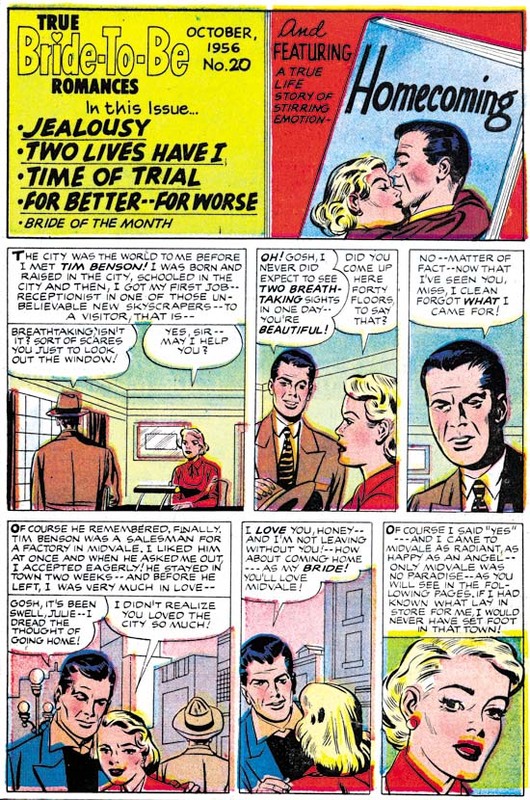 The Jack Kirby Blog has recently posted a scan of the cover to True Love Problems and Advice #42 (November 1956). 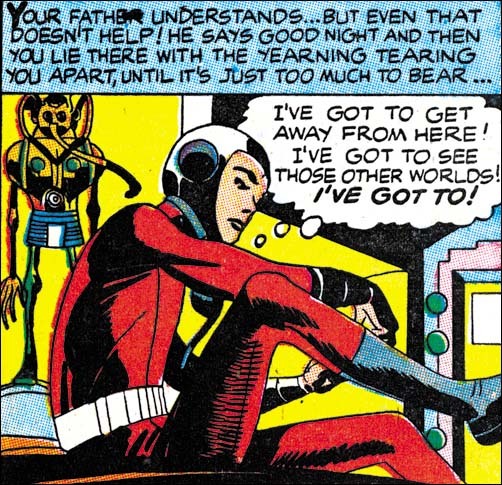 I would like to think Bob was inspired by my recent serial post (Jack Kirby’s Austere Inking). A little over a week ago I did a chapter on Kirby’s Harvey work which included romance covers. 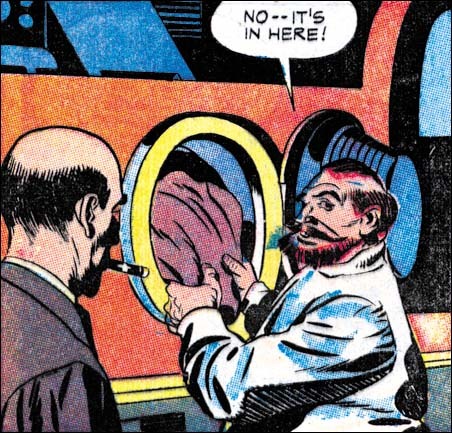 TLP #42 is certainly drawn by Kirby. Actually not one of his better efforts. I agree with Bob that the cop is the best part of the cover. 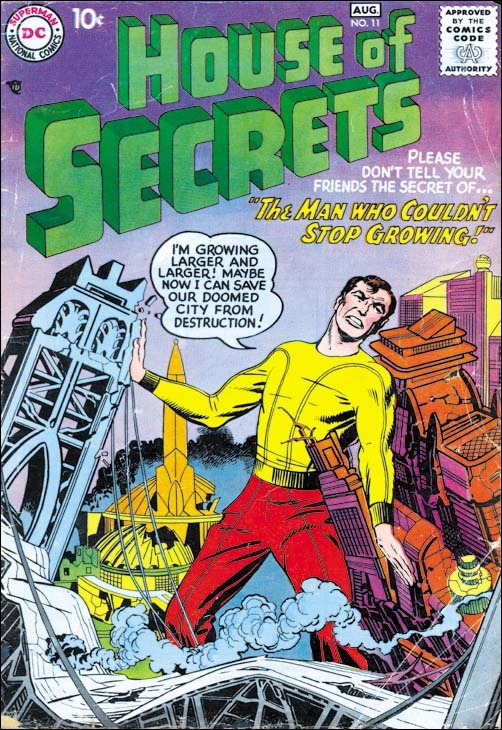 This cover was not inked by Kirby. 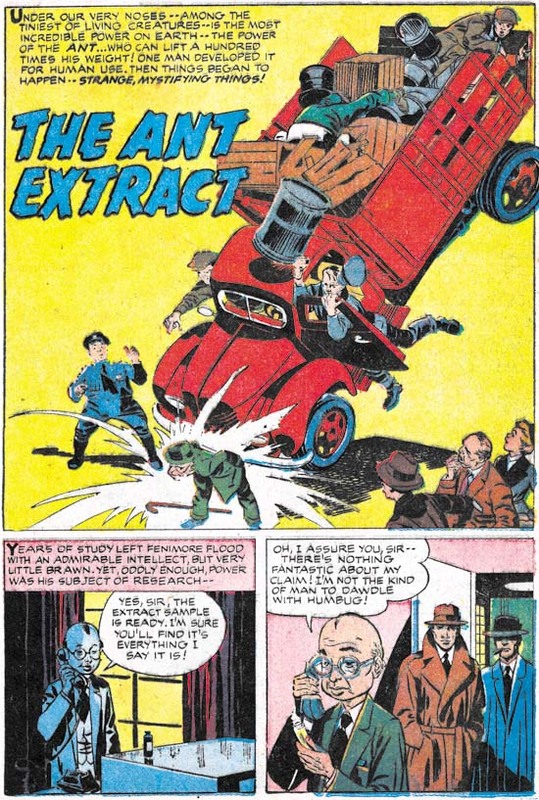 Judging by the spotting on the cop and his eyebrows I am certain this was inked by Bill Draut. Not one of his better inking jobs either. Again the best inking on the cover was done on the policeman. Posted May 13, 2007 in 2007/05, 7 Freelance, Atlas Kirby, Featured Work, Periods, Topic, z Archive. I am always unsure how to handle how much to reveal in my Feature Story posts. I have received a request to provide the end of “Poker Face”. So I have decided to provide the ending as a comment to this post. SPOILER ALERT: Do not click on comments if you do not want to know the ending for “Poker Face”.